The overlay will be colored green when the trend is positive, red when it is negative or grey when it is neutral. The standalone indicator has a value 1 for a positive trend, -1 for a negative trend or 0 for a neutral trend. The same color code is used in the standalone indicator. The indicator is meant to be used on a weekly time frame and measures the long term trend. It can also be used in the daily time frame to indicate shorter term trends. The trend is positive if the low of the week is above a rising 30 EMA and the 30 EMA has been rising for at least 3 weeks. The trend is negative if the high of the week is below a declining 30 EMA and the 30 EMA has been declining for at least 3 weeks. Otherwise the trend is neutral. From August 2000 till round March 2003 the trend is mostly negative. It does return to neutral territory a couple of times, but never becomes positive. From 2003 till late 2007 the trend remains mostly positive. It did fall into the neutral or even negative area during the more heavy corrections. 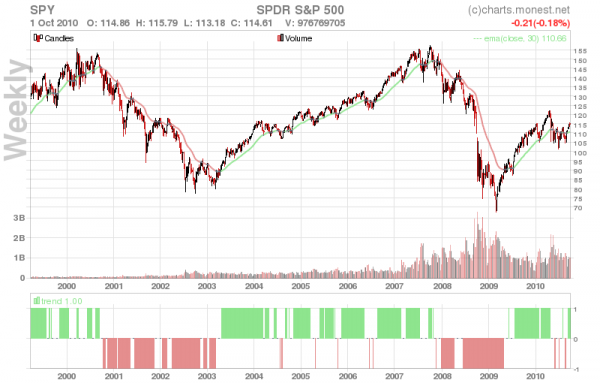 From 2008 till March 2009 the market is almost fully in the negative area. After March 2009 we are again in a positive area.